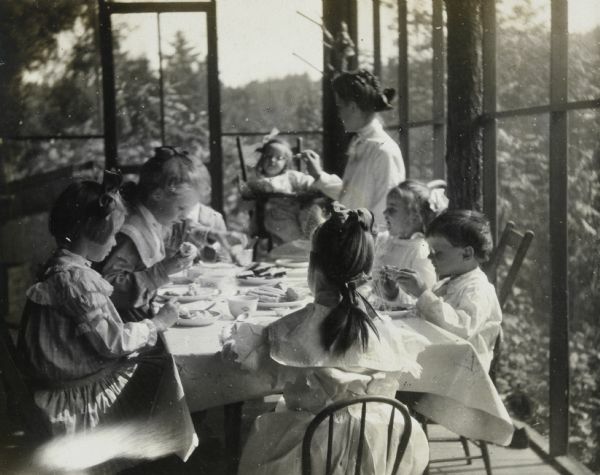 Holt and Stroh children are eating a meal together at a table on the porch at Island Lodge. Names on the right side of the table from front to back: Alfred Holt, Eleanor Holt, Ella, Donald Holt. Ella, a household employee, is feeding Donald Holt in a high chair. Jeannette Holt, with her back to the camera, is sitting at the head of the table. The Stroh girls are sitting on the left side of the table. Caption reads: "Everybody happy. Little Strohs, Little Holts, and Ella. Three times a day." Lucy Holt's sister Juliet Lay Rumsey married Grant Stroh and they had four daughters: Margaret, Harriet, Elizabeth and Juliet. Built in 1898, Island Lodge on Archibald Lake was the summer home of Lucy and W.A. Holt.